Drivers: What Do You Do When You See a Bicyclist? For a good laugh, check out this satirical take on bicyclists from The Onion. Everyone in LA can certainly relate! 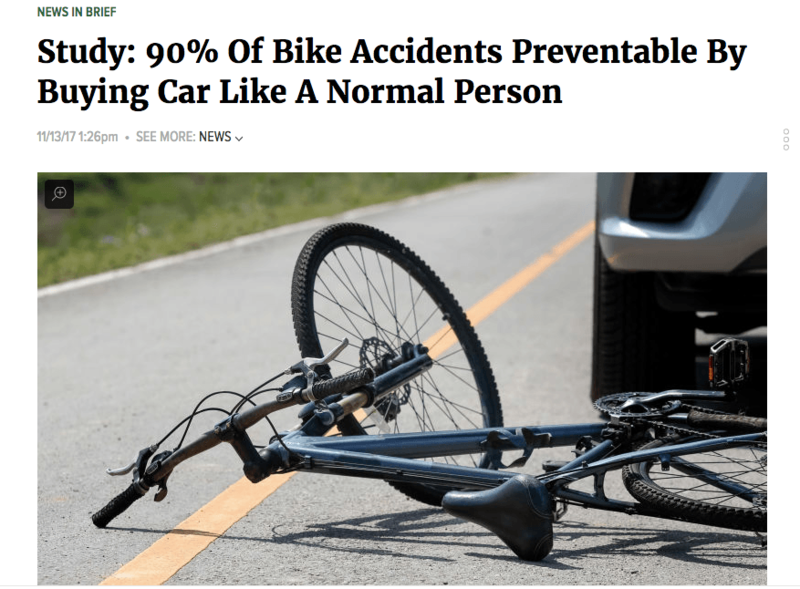 This “study” says that 90% of bike accidents could be prevented by buying a car like a normal person. According to “lead researcher” Dr. Laura Gafferty, this new data suggests that the “vast majority of cyclist injuries can be avoided simply by driving an automobile instead of biking around like some weirdo.” She adds that while bicycle riding is acceptable for kids, it’s not meant for grown-ups who are NOT competing in the Tour de France. The study goes on to suggest that fatalities would drop an estimated 40 percent within six months if people heeded this advice. OK, OK, done laughing? This is satire at its best, with a bit of truth sprinkled in. However, it does bring up a valid point: biking is still not viewed as “normal” or acceptable. As such, many motorists fail to give bicyclists their proper respect on the road, resulting in dangerous accidents, injuries and even deaths. One real statistic that isn’t funny at all: In 2015 alone, about 5,300 pedestrians and 800 bicyclists were killed in crashes with motor vehicles nationally. Sadly, California leads the nation in cyclist fatalities, with 338 cyclists killed in collisions with motor vehicles between 2010 and 2012. While biking is becoming more mainstream, it’s not quite there yet. Drivers just aren’t as careful as they need to be. As a result, we’re seeing more and more bicyclists hit by cars than ever before. As personal injury lawyers that specialize in motor vehicle and bicycle crashes, we are urging people to drive more safely while on the roadways. As a driver navigating LA’s bustling city center and outer neighborhoods, you may have one thing on your mind each day: getting to and from work quickly, or some version of that. We get it: the traffic is horrendous, drivers are aggressive and you either take what’s yours or risk falling behind in line. But next time you find yourself driving about, ask yourself these questions as soon as you spot a bicyclist in order to keep all reactions as safe as possible. If that were a car instead of a bike, how would I react? While your Spidey senses may tingle when you get too close to a car while driving, you may not feel the same way about bicyclists. You may assume it’s their responsibility to stay away from you. Essentially, they better get outta my way! Truth is, bicyclists have the same rights and responsibilities as motor vehicle drivers, says the California Bicycle Coalition. That goes both ways. It also means that motorists must heed bicyclists in traffic. Although California law stipulates that those who ride bikes must ride as close to the right side of the road as possible, they also have the right to “take the lane” if they are passing, preparing to take a left turn, trying to avoid a hazard or if the lane is simply too narrow to share with a vehicle. Just be aware that you both share the rules of the road. Even a slight bump to a cyclist from your car can cause grave injuries and even death. Are there other cars near me if I have to swerve? Always be alert as to the proximity of other cars and objects such as telephone poles, mailboxes, etc. It’s always wise to have an “out” – in other words, don’t box yourself in so tight that you wouldn’t be able to swerve to safety if you had to. Likewise, don’t box a bicyclist in, in the event they have to swerve quickly. How much room do they have? Always keep one car length between you and other vehicles as well as bikes. A good rule of thumb is to ensure you can see the rear wheels of the car or bicycle in front of you at all times. If you indeed see those wheels touching the ground, you know you have enough room to get around them in case of emergency. Which direction are they currently going? Bicyclists should be traveling WITH traffic on the right side of the road, except, of course, when they have to pass, make a legal left-hand turn or navigate a one-way street. Keep a lookout for hand signals directing you to their turns. Responsible bicyclists should always use hand signals for everyone’s safety. Tongue in cheek articles like the above one from The Onion show us that the misconception of bicyclists is still alive and well in LA. And while a good joke is easy to appreciate, a real bicycle accident is no joke at all. If you or anyone you know has been injured on a bike in an accident with a motorist, you need the bicycle accident lawyer Los Angeles trusts. Call Power Legal Group right away at 800-323-POWER (7693) for a free initial consultation.